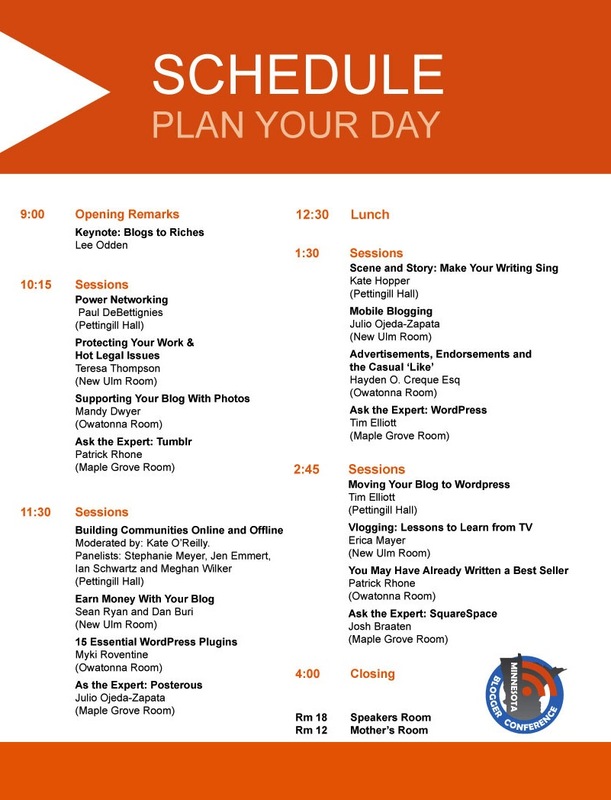 The second annual MN Blogger conference is coming up this Saturday. Last year the event sold out in less than 2 hours. This year we decided to spread out the tickets and offer them in three batches over three weeks. They still went like wildfire and we have a long waitlist, even though we doubled our capacity this year (we can accommodate 250)! My partner Arik Hanson and I felt we had a great event last year, and yet we still poured our energy into planning new, cool things for this year that we think will make the event awesome. Read Indeed – It’s a personal mission of mine to always include a charity or service opportunity at events I oraganize. Stacy at The Blogunteer pointed us to Read Indeed, a fabulous organization that collects books for children and teens in need. We’ll be collecting books at the conference, and Mandy from Glimpses of Soul Photography will be taking headshots for attendees with donations encouraged to Read Indeed. QR Code and Mobile Schedule – Attendees will be able to scan a QR code (or follow a link from twitter) to access the conference schedule from their smart phones. I first experienced this awesome technology at the UnSummit conference in Minneapolis a few months ago and loved how handy and functional it was. When Ian Schwartz stepped forward to make one for us, I jumped at the chance. Taco Bar – Ok, we had free lunch last year, too, and it was tasty. But this year, well, I’m pretty stoked about having a taco bar. It’s like the best meal ever… tacos… yum. I mean, really, need I say more? Awesome Sponsors – We couldn’t have asked for more supportive, amazing sponsors this year. Allina Hospitals & Clinics, TopRank Online Marketing and KARE 11 have been fabulous. Because of them, we’ve been able to keep the event free, offer lunch (ahem, taco bar) and hold the event in an amazing space suited for a large conference of our size. We couldn’t have done it without them. Of course, I could go on and on and on about our amazing planning team, specifically Beth Rubin-Gabor, Bridget Monroe, Suzi Magill and Josh Braatan, among others. Looking forward to spending the day Saturday with these great folks who will truly bring the event to life. Will you be there Saturday? What are you most excited about? p.s. are we connected on Facebook and twitter yet? Let’s do that! It will be so nice to connect with new people again this year. Last year was so nice and I have to admit, I’m looking forward to the taco bar, too! Thanks Mimi – looking forward to seeing you there! I am so excited about Saturday. I’m really looking forward to connecting with new people, too. And a taco bar? Even better! Glad I’m not the only one excited about tacos.